Home » Eye Diseases » What Is Keratoconus? What is Keratoconus? Keratoconus is a rare condition where the cornea forms in a cone shape. Normal corneas are rounded, only slightly bulging out beyond the eyeball. In people with Keratoconus, the cornea protrudes out in a shallow cone. This distorts vision and makes the eye more sensitive to glare. So what is Keratoconus? It’s a cone-shaped eyeball. What is Keratoconus caused by? The direct cause of Keratoconus isn’t known. Although it’s suspected to be genetic. But Keratoconus generally isn’t present at birth — it develops later, often in your teens. The first sign of Keratoconus is blurred vision. This can be cured with standard corrective lenses. However, as it develops and the corneas continue to change. Because of this, vision may become less treatable with normal lenses. You may start seeing multiple “ghosted” images. Your eyes will be more sensitive to glare. You may also feel eyestrain after working for a while. Other than strain, there is generally no pain connected to the condition. Once the corneas become more cone-shaped, then even normal corrective lenses cannot resolve the ghosting and multiple images that result. That’s why finding a good Keratoconus doctor is so important. Diagnosis of Keratoconus is difficult even when suspected by an Optometrist or ophthalmologist. Standard eye chart observations are not enough. A doctor can measure the curvature of the cornea with a device called a Keratometer, but these are not designed to detect Keratoconus, and the deformation of the cornea may exceed the instrument’s ability to measure. Once your doctor suspects Keratoconus may be a possibility, then often the best diagnostic method is direct observation. Advanced cases can be easily identified by the experienced eye of a Keratoconus doctor. In about half of cases there is also a ring of yellowish or greenish color called a Fleischer ring that can be seen in the cornea. 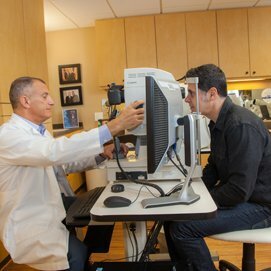 A modern technique known as computerized corneal mapping can also be used to detect Keratoconus. But irregularities in the structure of the eye, both related to and unrelated to Keratoconus, can still make diagnosis tricky. This is where the experience of the doctor in evaluating the results of all these tests can make a huge difference in identification of this rare condition. Does your Optometrist or Ophthalmologist suspect you have Keratoconus? Then finding a qualified Keratoconus specialist is the next step. Because Keratoconus can require specialized care, you should find the best eye specialist in your area. That’s when patients with Keratoconus all over Los Angeles call Dr. Barry Leonard. Dr. Leonard is a Keratoconus doctor who not only treats Keratoconus, but is actually a Keratoconus patient himself…so he knows what you are going through, and how to give you the best Keratoconus treatment available. Call Dr. Leonard’s office now at 818-891-6711. You can also make an appointment online. Use the link at the top of this page to get in touch today! Dr. Leonard helps eye patients in the valley fight the effects of Keratoconus. He combines cutting-edge technology with his unique, personal experience fighting the disease.